The African American Alumni Society scholarship allowed Taylor Floyd ’16 to continue her education at Wright State and discover her career of becoming a developmental neuroscientist. In the spring of 2000, several former Wright State students, faculty, staff, and community members gathered to plan a 30th anniversary celebration of Wright State’s first on-campus identity center — the Bolinga Black Cultural Resources Center. The Bolinga Center officially opened on the birthday of Martin Luther King Jr. — January 15, 1971 — 15 years before the day was designated a national holiday. The center sponsors tutoring and mentoring programs and also serves as a classroom, meeting room, study lounge, and library. The Bolinga Center is also credited with being a driving force in establishing the African American Collection in the Dunbar Library, and the African and African American Studies program. But the people who came together to plan the 30th celebration were able to collaborate and create one more program the Bolinga Center can be credited for — the African American Alumni Society. Wright remembered she had a colleague who was part of the African American Alumni Society at Earlham College, a liberal arts institution in Indiana. They began discussing a similar initiative at Wright State, and talked about the structure of the society at Earlham. Before long, the idea was more than an idea. Wright mentioned several people who were initially involved in the beginning stages, including Dr. Anthony Whitmore ’80, a former member of the Bolinga Center Advisory Board; Judge James F. Cannon ’73, ’74, former municipal court judge for the City of Dayton; Karen Hunt ’86, current Wright State Alumni Association Board member; and William ’70 and Linda Gillispie ’73, long-time supporters of Wright State. It had also become a goal of the alumni association in the early 2000s to diversify their engaged alumni population. Wright said this group embraced that idea and ran with it. 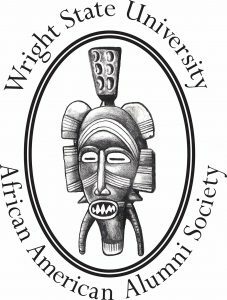 The first identity alumni society within the Wright State Alumni Association was the African American Alumni Society, founded in 2001 — shortly after the Bolinga Center anniversary. Forming the society has long been a proud moment for Wright, who first set foot on campus in 1969. Since then, she has been a long-time social justice and civil rights activist. As a student, she marched for equality on campus and was a leading student founder of the Bolinga Center. She came from a predominantly white high school in Dayton, but, when she came to Wright State, she was disappointed to find the number of black students was so small. As momentum for building a black cultural center on campus grew, Wright became involved with the Committee for the Advancement of Black Unity (CABU). The vision for CABU extended beyond that of a student organization planning social activities to one that would explore the history and significance of black people in America. Tensions came to a tipping point over the winter break in 1971, when several students, including Wright, participated in a sit-in in President Brage Golding’s office when a black female employee was terminated. The Bolinga Black Cultural Resources Center was founded later that month, with Yvonne Chappelle as its first director. “Dr. Yvonne taught us a lot in terms of how important scholarship was,” Wright said — something Wright carried over into her role as Bolinga Center acting director from 1977 to 1980, and eventually into the development of the African American Alumni Society and its scholarship. 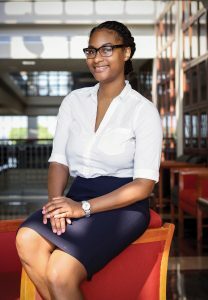 Scholarship recipient Ebony Davenport ’13 is now a faculty member at the University of Dayton School of Law. It was that overall purpose and Wright’s time working in the Bolinga Center that inspired her to help establish the African American Alumni Society’s most important goal — building a scholarship fund for black students at Wright State. “Once we began to meet as a society, [our goal was] helping African American students not only get to Wright State, but get through Wright State,” Wright said. But, she said, at the forefront of most of their initial conversations about providing support for students was one thing — finances. Establishing a scholarship program became the society’s main goal and, as Wright recalls, it was an incredibly personal decision for many of the members, including herself. “We just knew how difficult it was for African American students on a white campus to, first, feel included, and to, secondly, succeed because of a lot of different pressures — and one of those was financial,” Wright said. According to the scholarship agreement, the African American Alumni Society Scholars Fund is awarded by the Office of Financial Aid and the African American Alumni Society to recipients who are of African American descent, have demonstrated financial need, are enrolled for a minimum of six credit hours, live in the Greater Miami Valley area, and meet GPA requirements. The official decision is made by the African American Alumni Society’s scholarship committee. Former president of the African American Alumni Society and current Wright State Alumni Association board member Edwin Mayes ’89, ’96, said being involved with the scholarship program has been incredibly rewarding because he is passionate about helping students who are in circumstances similar to his at one time. A physician. A law professor. A neuroscientist. A TV reporter. A fundraiser. A social worker. An advocate for the disabled. A registered nurse. A marketing analyst. An entrepreneur. A radio disc jockey. All of these are jobs currently held by Wright State alumni who all have one thing in common—they were each recipients of the African American Alumni Society scholarship as students. And many of them say they owe their career success specifically to this scholarship, not only for the financial award, but for its secondary benefit—a reason to drive for success. Alumna Ebony Davenport ’13 was a recipient of the scholarship in 2009. After graduation, she was accepted to the University of Dayton School of Law and earned her J.D. She is now on faculty there as a visiting assistant professor, teaching legal profession and criminal law lab courses. 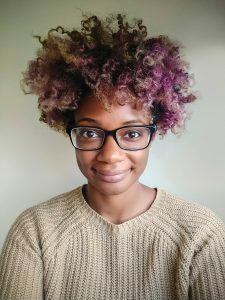 Another recipient of the scholarship, Taylor Floyd ’16, also pursued graduate school and is currently earning her doctorate in neuroscience from Weill Cornell Graduate School in New York City. She is a third-year graduate student analyzing how a small mutation in the human genome can lead to developmental ataxia in children. Floyd says the scholarship allowed her to continue her education at Wright State and find the career path she wanted to pursue — becoming a developmental neuroscientist. When the scholarship became available to students in April 2006, it was funded primarily by society members through traditional fundraising methods. The society fundraised until the scholarship was successfully endowed within the Wright State University Foundation in 2012, a significant accomplishment. Mayes agreed that the initial grassroots fundraising was rewarding, but sees this endowment as a big step toward the scholarship’s future. Within the next 10 years, Mayes hopes the program could maybe even provide a full scholarship or other opportunities. As for the future of the program, Wright said the goal remains the same—helping students reach their goals. For more information on the African American Alumni Society’s scholarship program, visit wrightstatealumni.com/scholarships.